"Karar" redirects here. For the Iranian unmanned aerial combat drone, see Karrar (UCAV). For the car, see MG 3. The MG 3 is a German general-purpose machine gun chambered for the 7.62×51mm NATO cartridge. The weapon's design is derived from the World War II era MG 42 universal machine gun that fired the 7.92×57mm Mauser round. The MG 3 was standardized in the late 1950s and adopted into service with the newly formed Bundeswehr, where it continues to serve to this day as a squad support weapon and a vehicle-mounted machine gun. The weapon and its derivatives have also been acquired by the armed forces of over 30 countries. Production rights to the machine gun were purchased by Italy (MG 42/59), Spain, Pakistan (MG 1A3), Greece, Iran, Sudan and Turkey. Soldiers of the West German Bundeswehr on exercise in 1960. Pictured is the predecessor to the MG 3—the MG 1A3 variant. The soldier on the right is carrying a G3 battle rifle. In the rear stands a SPz 11-2. At the end of World War II the original technical drawings and data for the 7.92×57mm Mauser chambered MG 42 were captured by the Soviets. These would eventually find their way to Czechoslovakia and Yugoslavia. Rheinmetall had to reverse engineer the first postwar machine guns from an original MG 42 machine gun. Production of the first postwar variant of the MG 42 chambered for 7.62×51mm NATO ammunition (designated the MG 1) was launched in 1958 at the Rheinmetall arms factory as requested by the Bundeswehr. Shortly thereafter, the machine gun was modified, receiving a chrome-lined barrel and sights properly calibrated for the new round; this model would be named the MG 1A1 (known also as the MG 42/58). A further development of the MG 1A1 was the MG 1A2 (MG 42/59), which had a heavier bolt (950 g (33.51 oz), compared to 550 g (19.40 oz)), a new friction ring buffer and was adapted to use both the standard German continuous DM1 ammunition belt and the American M13 disintegrating belt. Further improvements to the weapon's muzzle device, bipod and bolt resulted in the MG 1A3. Simultaneously, wartime 7.92×57mm Mauser chambered MG 42 machine guns that remained in service were converted to the standard 7.62×51mm NATO chambering and designated MG 2. In 1968, the MG 3 was introduced and entered production. Compared to the MG1A3, the MG 3 features an improved feeding mechanism with a belt retaining pawl to hold the belt up to the gun when the top cover plate is lifted, an added anti-aircraft sight and a new ammunition box. MG 3s were produced for Germany and for export customers by Rheinmetall until 1979. 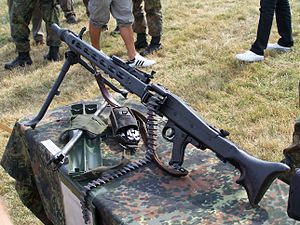 The preceding non-MG 3 variant machine guns in the Bundeswehr inventory were gradually converted to the MG 3 standard. Some additional production of the MG 3 in Germany was carried out by Heckler & Koch. The MG 3 and its variants all share a high level of parts interchangeability with the original MG 42. The German military instructs sustained fire must be avoided at all costs. In the bipod mounted light machine gun role MG 3 users are trained to fire short bursts of 3 to 5 rounds and strive to optimize their aim between bursts fired in succession. In the tripod mounted medium machine gun role MG 3 users are trained to fire short bursts and bursts of 20 to 30 rounds and strive to optimize their aim between bursts fired in succession. MG 3 of the German Army. The MG 3 is an automatic, air-cooled, belt-fed short recoil-operated firearm. It features a roller locked bolt mechanism that consists of the bolt head, a pair of rollers, the striker sleeve, bolt body and return spring. The bolt is locked securely by a wedge-shaped striker sleeve, which forces two cylindrical rollers contained in the bolt head outward, and into corresponding recesses in the extension of the breech of the barrel. On firing, both the barrel and barrel extension recoil to the rear. The resulting impact (much like a Newton's cradle) moves the carrier to the rear withdrawing the wedge and both rollers as they are cammed inward and out of their sockets by fixed cams, unlocking the bolt head. The bolt carrier and bolt then continue to the rear together guided by fixed guides while the barrel and barrel extension return to battery. Upon return of the bolt forward, the impact of the rollers against the camming surfaces on the breech carry the rollers from their seats, and, together with the surfaces on the striker sleeve, force the rollers outward, locking the bolt head into the barrel extension and ensuring a complete lock. The bolt also houses a spring-loaded casing extractor and ejector. Ejection is carried out when the ejector strikes the buffer head, sending a push forward through the ejector bar, which hits the ejector pin. This pin pushes the top of the base of the cartridge, which is still held by the extractor at the base, causing the empty casing to rotate and eject downward through the ejection chute. The machine gun has an automatic-only trigger mechanism and a cross-bolt safety in the form of a button that is operated by the shooting hand (in its "safe" position the bolt release is disabled). The weapon fires from an open bolt. The cyclic rate can be altered by installing different bolts and recoil springs. A heavier bolt uses more recoil energy to overcome inertia, thus slowing the action. On MG 3 machine guns, two types of bolts are available, with standard weight (about 650 g (22.93 oz)) for the standard 1,000–1,300 rounds per minute cyclic rate of fire and with extra weight (about 900 g (31.75 oz)) for a slower 800–950 rounds per minute cyclic rate of fire. It must be noted that those bolts also are used along with different return springs. The MG 3 feeds from the left side through a feed block using metal, 50-round continuous-link DM1 ammunition belts (which can be combined by cartridge) or disintegrating-link M13 or DM6 belts. In the light machine gun role, the MG 3 is deployed with a 100-round (or 120-round in case of disintegrating belts) belt fitted inside a synthetic ammunition drum developed by Heckler & Koch that is latched on to the left side of the receiver. The rear wall of the drum is transparent and serves as a visual indicator for the amount of ammunition available. The feed system operates through a feed arm that is housed in the feed cover. Two feed pawls are linked to the front end of the arm by an intermediate link and move in opposite directions, moving the belt in two stages as the bolt moves back and forward during firing. For the light machine gun role the MG3 is equipped with a synthetic polymer stock and a folding bipod. The MG 3 seen here in the stationary, heavy machine gun role, mounted on a stabilized Feldlafette tripod and fitted with an optical Zielfernrohr 4 × 24 periscope sight. The MG 3 has a quick-change, chrome-lined barrel with four right-hand grooves and a rifling twist rate of 1 in 305 mm (1:12 in) and weighs 1.7 kg (3.7 lb). Alternatively, MG 3 barrels can also have polygonal rifling. The barrel is integrated with the barrel breech. During sustained firing, there is a need for the barrel to be changed and this is how they are swapped: The gun is cocked and the barrel catch on the right of the barrel shroud is swung forward. Then, the breech end of the hot barrel swings out and can be removed by elevating or twisting the gun. A fresh barrel would be inserted through the barrel catch and the muzzle bearing. When the catch is rotated back, the barrel is locked and the machine gun can resume firing. Both the receiver housing and ventilated barrel casing are made from pressed sheet steel. A muzzle device is mounted at the end of the barrel and it acts as a flash suppressor, muzzle brake and recoil booster. The open-type iron sighting line has a relatively short 430 millimeters (16.9 in) radius and consists of a "∧-type" height adjustable front sight on a folding post and a leaf rear sight with an open V-notch sliding on a ramp, graduated from 200 to 1,200 meters (219 to 1,312 yd) in 100 meters (109 yd) increments. A flip-up anti-aircraft sight is attached to the receiver top just in front of the normal rear sight element. MG 3 machine guns are belt-fed, using non-disintegrating metal DM1 belts, which have links that wrap around the cartridge case and are linked by a coiling wire on each side. DM1 belts are preloaded at ammunition factories in 50-round connectable belt lengths and can be linked to any length necessary. Alternatively the MG3 can also be fed by disintegrating metal M13 link belts (designated DM60 by Germany) used by many NATO member states. M13 links are also used on the Dillon M134D Minigun, M60, FN MAG, AA-52 and HK21 machine guns among others. Both belt types use a metal lip that is arrested in the rim of the cartridges to correctly position and fix the cartridges in place. For field use there are several ammunition containers available. The Gurttrommel (belt drum) contains a 50-round DM1 or DM60 belt. The Gurttrommel is not a true magazine but holds a curled 50-round belt preventing it from snagging, twisting and getting stuck during mobile assaults. The steel DM2 ammunition box contains a 250-round DM1 belt and the smaller plastic DM40004 ammunition box contains a 100-round DM1 belt or a 120-round DM60 belt. The German military tends to use non-disintegrating DM1 belts for general use and disintegrating DM60/M13 belts in vehicle or aircraft fixed MG3 mountings that allow for collecting the ejected link pieces for reuse. In a stationary, heavy machine gun role the MG 3 is mounted on a buffered Feldlafette ("field tripod") that also features storage containers for accessories like the Zielfernrohr 4 × 24 periscope-style telescopic sight. The direct fire only Zielfernrohr 4 × 24 sight like the MG 3 is mounted on the Feldlafette and is graduated from 0 to 1,600 meters (0 to 1,750 yd) in 100 meters (109 yd) increments. The Zielfernrohr 4 × 24 reticle can be illuminated by an external unit. It can also be used with the FERO-Z 51 night sight. A unique feature of the German World War II Feldlafette types that was not carried over to the MG3 Feldlafette was the Tiefenfeuerautomat ("in-depth automatic fire"). If selected, this feature walked the fire in wave like motions up and down the range between predefined ranges. This sweeping of a given range (Tiefenfeuer - "in-depth fire") continued as long as the gun was fired. German naval security troops deployed in a training scenario with an MG 3 (1990s). MG 1: Rheinmetall variant of the MG 42, most notably rechambered to fire 7.62×51mm NATO. MG 1A1 (MG 42/58): As MG 1, but with sights properly calibrated for the new round. Sights refitted to existing MG 1s. MG 1A2 (MG 42/59): MG 1A1 variant; product improved with longer ejection port, heavy bolt and friction ring buffer. MG 1A3: MG 1A2 variant; product improvement of all major components. MG 1A4: MG 1 variant; for fixed mount armor use. MG 1A5: MG 1A3 variant; MG1A3s converted to MG1A4 standard. 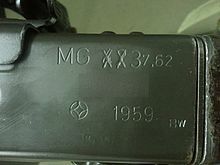 MG 2: Designation for all wartime MG 42s rechambered to 7.62×51mm NATO. MG 3: MG 1A3 variant; product improved with AA rear sight. MG 3E: MG 3 variant; reduced weight model (roughly 1.3 kg lighter), entered into late 1970s NATO small arms trials. MG 3A1: MG 3 variant; for fixed mount armor use. MG 3KWS: MG 3 variant; developed by Rheinmetall and Tactics Group as a stand in until the HK121 replaces it. MG 42/59: Italian variant produced by Beretta, Whitehead Motofides and Franchi, since 1959, Chambered in 7.62×51mm NATO. The bolt weight was increased to 1,200 g (42.33 oz)) for a reduced 800 rounds per minute cyclic rate of fire. Used mainly mounted on vehicles and has largely been phased out by the M249 SAW. Ksp m/94: Swedish variant chambered with the 7.62×51mm NATO round. Mainly used as secondary armament in Stridsvagn 122. A mounted variant with three rotating barrels (to reduce barrel erosion and overheating) is under development as the Rheinmetall RMG 7.62 as a vehicle weapon. The MG14z is a double barrel variant of the MG 3 machine gun. The MG14z enhances the firepower of military units that still issue the MG 3 or other MG 42 derivatives. It has been developed by the Tactics Group GmbH company "a low-cost alternative to Miniguns". 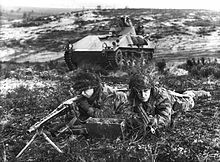 The MG 3 is still used as the standard secondary weapon of most modern German armoured fighting vehicle designs (e.g. Leopard 2, PzH 2000, Marder), as a primary weapon on light/non-armored vehicles (e.g. LKW 2to, MAN gl-trucks, ATF Dingo) and as an infantry weapon on light bipods as well as different tripods. The German Armed Forces have supplemented the MG 3 since 2012 with the HK121 in service. German soldier and U.S. Marine training with the MG 3. Italy employs the MG 42/59 version primarily on vehicles and rotary-wing aircraft. Seen here mounted on the B1 Centauro wheeled armoured vehicle. Spanish Marine with the MG 3. Spanish guns are manufactured by General Dynamics Santa Bárbara Sistemas. A pintle-mounted MG 3A1 on a Norwegian Leopard 1 armoured recovery vehicle. Albania: Used by the Albanian Army. Argentina: Used by the Argentine Army. Australia: The MG 3 was used between 1976 and 2007 as an anti-aircraft weapon on the Australian Army's Leopard AS1 MBT. Austria: Uses the MG 74 which is a MG 42/59 variant licensed from Beretta and manufactured by Steyr Mannlicher. The MG 74's cyclic rate of fire is 850 rounds per minute. Azerbaijan: The Military of Azerbaijan acquired a small quantity of MKEK MG 3s from Turkey. Brazil: MG3 and MG3A1 are used by the Brazilian Army at the Leopard 1A5 BR. Canada: Only used on 20 Leopard 2A6M CAN tanks acquired from Germany. Leopard 2s acquired from other sources will continue to use the FN MAG. Czech Republic: Used on Dingo 2. Denmark: MG 42/59 designated M/62 in Danish service. Estonia Designated as MG 3. MG 1A3 version with the anti-aircraft sight. Finland: As the 7.62 KK MG 3. Used with the Leopard 2 tanks and NH90 helicopters. Germany: Used by the Bundeswehr. Greece: License production by Hellenic Defense Systems or EAS (formerly Hellenic Arms Industry; Elliniki Biomihania Oplon – EBO). Iceland: Used by the Icelandic Coast Guard. Iran: License production by Defense Industries Organization as the MGA3. Italy: License production of the MG 42/59 by Beretta with parts made by Whitehead Motofides and Luigi Franchi; while largely replaced in squad support weapon role by the Belgian FN Minimi, it still sees widespread mounted use on ground-based vehicles and helicopters. Prior to the procurement of the Minimi, the Stabilimento Militare Armi Leggere (SMAL) at Terni has developed a kit to adapt the Italian Army's existing MG 42/59 machine guns to accommodate 5.56×45mm NATO ammunition. The kit comprises a new barrel, bolt head, feed opening and cover, recoil-enhancing element and a lighter bolt. The weight of the modified 5.56 mm MG 42/59 machine gun remains unchanged from the original version. Mexico: License produced by SEDENA in Mexico. Myanmar Clones made in Myanmar as the MA 15. Pakistan: Used by the Pakistan Army. Manufactured under license by Pakistan Ordnance Factories from 1960s in Wah Cantt. Poland: On Leopard 2 tanks and support vehicles. Intended to be replaced by UKM-2000 and WKM-B. Sudan: Made by Military Industry Corporation as the Karar. Sweden: As the KSP m/94. Used with the Leopard 2 tanks. Thailand: Used on Commando V-150 APC. Turkey: Made by MKEK in Kırıkkale under license since 1974 for the Turkish Armed Forces and Turkish Gendarmerie. FN MAG 7.62mm (NATO) general-purpose machine gun. Heckler & Koch HK121 7.62mm (NATO) general-purpose machine gun. MG51 7.5×55mm (Swiss) general-purpose machine gun. SIG 710-3, Swiss derivative of MG 42. ^ McNab, Chris (2002). 20th Century Military Uniforms (2nd ed.). Kent: Grange Books. p. 31. ISBN 1-84013-476-3. ^ a b "What It's Really Like to Fight for the Islamic State". www.youtube.com. ^ Dnevnik (in Slovenian). Ljubljana, Slovenia: Radiotelevizija Slovenija. 2015. Event occurs at 17:13. Retrieved 8 August 2015. ^ a b "Hellenic Defense Systems". Eas.gr. 2013-07-31. Retrieved 2014-02-09. ^ Woźniak, Ryszard: Encyklopedia najnowszej broni palnej—tom 3 M-P, page 106. Bellona, 2001. ^ "MKEK – PRODUCT DETAILS". Archived from the original on 2009-09-15. Retrieved 2014-04-04. ^ Shepherd, Christian. "Machine Gun 42". Tactical Life. Retrieved 2014-02-09. ^ Steve, Johnson. "Bundeswehr MG3KWS Upgrade Program". The Firearm Blog. Retrieved 2014-01-19. ^ "Tactics Group MG-14z - Trade Shows 2014 - IWA 2014 - all4shooters.com". all4shooters.com. Retrieved 2014-06-28. ^ "Двуствольный пулемет Tactics Group MG-14z » Военное обозрение". topwar.ru. Retrieved 2014-06-28. ^ "Leopard AS1 Main Battle Tank Part One by Paul D. Handel". Retrieved 2014-01-11. ^ "Österreichs Bundesheer – Waffen und Gerät – Maschinengewehr MG 74". Bmlv.gv.at. Retrieved 2014-02-09. ^ "Bangladesh Military Forces | The internet's authority on Bangladesh Defence and Bangladesh Armed Forces". Bdmilitary.com. Retrieved 2014-02-09. ^ "An error has occurred in Portfolio NetPublish". combatcamera.forces.gc.ca. Archived from the original on 2016-01-10. Retrieved 2014-04-04. ^ a b c d e f g Jones, Richard D.; Ness, Leland S., eds. (January 27, 2009). Jane's Infantry Weapons 2009/2010 (35th ed.). Coulsdon: Jane's Information Group. ISBN 978-0-7106-2869-5. ^ a b c d e f "G3 Defence Magazine August 2010". En.calameo.com. 2010-08-04. Archived from the original on 2012-03-25. Retrieved 2014-02-09. ^ "Uudised – Kaitsevägi". Mil.ee. Retrieved 2014-02-09. ^ "Puolustusvoimat" (in Finnish). Mil.fi. Retrieved 2014-02-09. ^ "Hátt í 400 hríðskotabyssur í landinu". RÚV. Retrieved 2014-10-27. ^ a b c Jenzen-Jones, N.R. ; McCollum, Ian (April 2017). Small Arms Survey (ed.). Web Trafficking: Analysing the Online Trade of Small Arms and Light Weapons in Libya (PDF). Working Paper No. 26. p. 85. ^ Small Arms Survey (2015). "Trade Update: After the 'Arab Spring'" (PDF). Small Arms Survey 2015: weapons and the world (PDF). Cambridge University Press. p. 110. ^ (in Lithuanian) Lietuvos kariuomenė :: Ginkluotė ir karinė technika » Kulkosvaidžiai » Kulkosvaidis MG-3. Kariuomene.kam.lt (2009-04-17). Retrieved on 2010-10-18. ^ "Mexico Mexican army land ground forces military equipment armoured vehicle pictures information desc - Army Recognition". Retrieved 2014-01-11. ^ "Pakistan Army". Defence.pk. Archived from the original on 2013-05-13. Retrieved 2014-02-09. ^ "POF – Machine Gun MG3 (MG1A3)". Pof.gov.pk. Archived from the original on 2013-10-29. Retrieved 2014-02-09. ^ Henrik Svensk. "Strv122 Stridsvagn 122 Leopard 2". Soldf.com. Retrieved 2014-02-09. ^ Austin, Rod (28 Nov 2018). "Yemen: inquiry finds Saudis diverting arms to factions loyal to their cause". The Guardian. Ezell, Edward C. (1988). Small Arms Today 2nd Edition. Harrisburg, PA: Stackpole Books. Woźniak, Ryszard (2001). Encyklopedia najnowszej broni palnej—tom 3 M-P (in Polish). Warsaw, Poland: Bellona. ISBN 83-11-09311-3. Wikimedia Commons has media related to MG3.